At StoneWords.com, you have your choice of three different types of pocket stone products. Our highly polished semi precious pocket stones come in pocket sizes that are approximately 1.75 inches in diameter. The engraving can be in script, all capitals, block or all lowercase letters. While the pocket stones are multi-colored, the lettering can be filled in with gold, black, or white. Our pocket stones are custom engraved and are very popular with churches, as wedding and party favors, or with any type of group that wants to send a message by handing out engraved pocket stones. Choose from among many animal designs or symbols such as a peace sign, or have a word or logo engraved. Unlike our competitors, we will gladly engrave both sides of the stones--at an affordable price! A word such as "spirit," "truth," or "wisdom" might mean something special to your friends or wedding guests. Similarly, it could have a special meaning to you that you want to share with a group. You could put a word on one side of the stones and a symbol, such as an angel or cross on the other side. We have standard engraved words and symbols to choose from. However, many of our customers like to have their pocket stones custom engraved with special words. We can engrave any word, thought, name, phrase or design that you want custom engraved just for you or a special someone in your life. The easy way to order and receive personalized help and service is to call the Jennifer at 973-948-0085 to place your order by phone. (1) Highly polished semi-precious stones measuring 1.75" wide in bright colors. (2) Polished River Stones measuring 2"-3" wide in earthtone desert stone colors. (3) Natural River Stones unpolished available in gray, white, pastel green, pastel peach, or a mix of all colors. The natural River Stones are available in sizes as follows: 1.0",1.5", 2", 3" & 4.0" wide and many larger stones sizes. These engraved pocket stones have motivational, spiritual, designs, logos and uplifting sentiments carved into each stone as you desire. 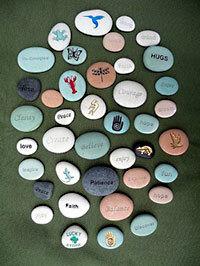 Our river stones can also be customized for any special event. Drop us an email or call 973-948-0085 for personalized assistance. Engraved River Stones, natural, unpolished, 1.0" wide, available in stone colors of gray, white, pastel green, pastel peach or a mix of stone colors. 5 letter maximum word or phrase, or design. Engraved River Stones, unpolished, 1.5" wide. Engraved River Stones, natural, unpolished, 1.5" wide, available in stone colors of gray, white, pastel green, pastel peach. or a mix of all stone colors. Engraved River Stones, unpolished, 2.0" wide. Engraved River Stones, natural, unpolished, 2.0" wide, available in stone colors of gray, white, pastel green, pastel peach, or a mix of all stone colors.